Last week in several posts, in several ways, I wondered with you if Lent might be a time to practice opening our eyes to what is around. I don’t claim I am open to my surroundings all the times I should be and I know that often it is only later that I get a hint of what I might have missed. 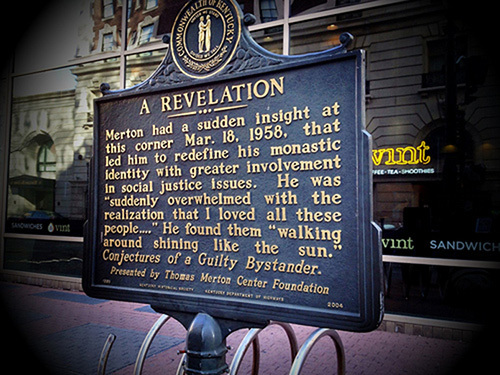 We can be encouraged by the experience of others, such as Thomas Merton who did catch a glimpse of who was around him as he stood on a busy corner in Louisville, Kentucky. March 18th is marked as day Merton had his “4th and Walnut Epiphany.” As you read over his words do they connect for you with the first feast mentioned in our Lenten prayer. In Louisville, at the corner of Fourth and Walnut, in the center of the shopping district, I was suddenly overwhelmed with the realization that I loved all these people, that they were mine and I theirs, that we could not be alien to one another even though we were total strangers. It was like waking from a dream of separateness, of spurious self-isolation in a special world. . . .
Then it was as if I suddenly saw the secret beauty of their hearts, the depths of their hearts where neither sin nor desire nor self-knowledge can reach, the core of their reality, the person that each one is in God’s eyes. If only they could all see themselves as they really are. If only we could see each other that way all the time. There would be no more war, no more hatred, no more cruelty, no more greed. . . . But this cannot be seen, only believed and ‘understood’ by a peculiar gift.